Living in California has it perks, one of which is the amazing west coast of the Pacific Ocean. One of my favorite places to go is the Monterey area which is located a few hours south of San Francisco. It is home to gorgeous shorelines, mild weather and cozy communities like Pebble Beach, Pacific Grove, Monterey and Carmel. 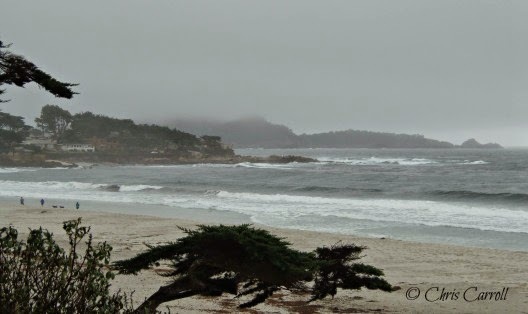 My husband and I were invited to stay at a lovely inn in Carmel for a weekend getaway and we could not have chosen a better time to visit this amazing area. What we think of as the town of Carmel is actually made up of two different towns; Carmel-by-the-Sea and Carmel. They both blend together to create an amazing area of gorgeous shops, small inns and hotels, superior eating establishments and, of course, the stunning coastline and beaches. Our home away from home for the weekend was Hofsas House. This is a delightful boutique inn that boasts old world charm with many of today’s amenities that we look for in a hotel. Owned and run by the granddaughter of the original owner, this charming hotel has a European flair with the architecture and the décor in the rooms. 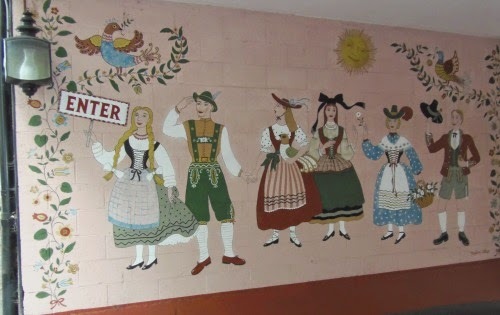 The exterior features a Bavarian theme mural by Maxine Albro on the wall of the driveway that welcomes guests and several paintings by her are hanging adding to the charm of the décor. Hofsas House is unique in that it is built into a hill. The hotel is four stories high and street level is actually the 3rd level. Parking is either on the street or behind and below the hotel with a steep walk up or several levels of stairs, depending on where your room is located. My husband is disabled and with no elevator, this did present a bit of a dilemma with the fact that our room was located on the 4th floor. However, the staff was fabulous and was able to move us to the street level, with parking right outside of our door. Cheers! Our room was a great size and offered a king size bed plus a kitchenette with a small table and chairs, refrigerator, microwave and sink. The updated bathroom was a good size with a tub and shower combo plus plenty of space. The room also featured a private balcony with two chairs and a small table to enjoy the ocean view. Heaven. The room also has a small TV with tons of channels (who needs TV on vacation?) and free wi-fi that was fast and reliable. Other rooms offer personal fireplaces and even larger rooms that sleep 6 that is perfect for families. They also have a nice swimming pool, heated, and a conference or party room that can be booked for special events. It offers a fireplace and kitchen too. We were greeted with a selection of specialty cheeses and a bottle of white wine that was fabulous. Engraved glasses are a nice touch. This is an option that is available as part of the Hofsas House offerings for your enjoyment during your stay. You can also choose Champagne and cheese instead. Other offerings the Hofsas House has available include a couples massage, special decorating in the room for romantics getaways for birthdays or anniversary’s. You can also enjoy a fun Beach Fire and S’mores bundle for an enjoyable evening on the beach with the family or choose a romantic touch with flowers and a message in the sand. Because of the rain we had during our stay, we opted to skip the one that was booked for us. Friday evening, after we enjoyed our appetizer of wine and cheese in the comfort of our room, we headed over to Anton + Michele’s in Carmel for a wonderful dinner. My husband had the Kobe Beef Short Ribs that they are known for and they were amazing! Fall apart tender and so delicious! I opted for the New York Steak and it was prepared perfectly and tasted wonderful. The ambiance in the restaurant was just right for an intimate gathering with friends or family and enjoying a delicious meal. I would definitely eat there again! Saturday dawned wet and cool but that did not stop us from hitting the town running. We started at Hofsas House and their light continental breakfast that consists of pastries from a local bakery that were to die for as well as fruit, yogurt, coffee and juice. 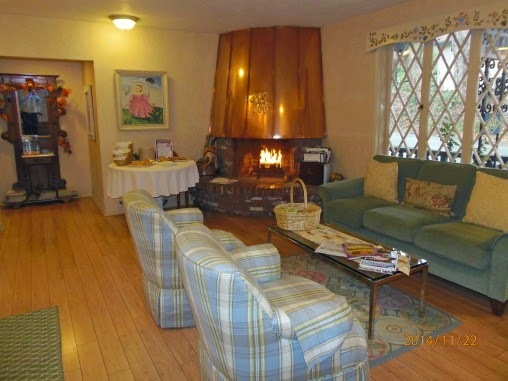 You can sit in the cozy office sitting area and enjoy the toasty fire in the copper fireplace or take it back to your room. Armed with a tasty picnic deli lunch, compliments of 5th Avenue Deli in Carmel, we headed to the beach for our first taste of the ocean. Between the fabulous sea air and the delicious lunch of Rueben sandwiches, Macaroni Salad, chips and a sweet treat of mouth-watering Lemon Bars, we were in heaven! Great place to grab your lunch to go! Carmel has a fabulous Wine Walk that I just had to check out. The area is rich in wonderful wineries and is quickly becoming known for the winery and wine tasting destination in California. I was excited to be able to sample several tastings along the Wine Walk in Carmel with the Wine Walk Passport. What a fun way to spend the afternoon! Finding things to do in the Monterey area is not hard. We spent several hours at the famed Monterey Bay Aquarium. It had been at least 10 years since we had visited and the changes are wonderful. 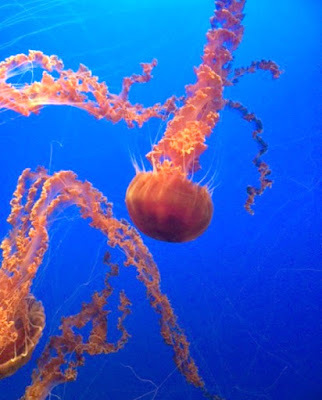 The sealife and cool displays are perfect for adults and kids of all ages! If you have not visited, you simply must. All of these arrangements were made by the folks at Hofsas House as a part of their activity offerings. If you are a golfer, you can also enjoy many of the famous golf courses at Pebble Beach or just enjoy a walk around Carmel, a quaint small town, rich in history and unique architecture, which is structured to be enjoyed on foot. While the area and town is often thought as too expensive, we found it to be in line or cheaper than many of the hotels and areas that we have stayed in before. The hotel offers free wi-fi, no extra taxes or fees, and comfortable, affordable rooms. The restaurants and shops we visited were all priced well and in many cases, less than my own home town! My husband and I had a fabulous weekend at Hofsas House and we would definitely enjoy staying there again. 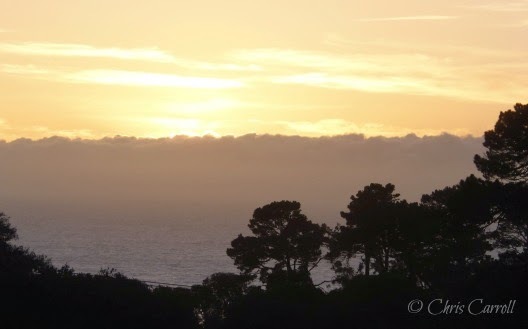 Carmel is a delightful town that cannot be missed during your visit to the Monterey area. Disclaimer: Chris and her husband enjoyed a complimentary weekend stay at the Hofsas House. 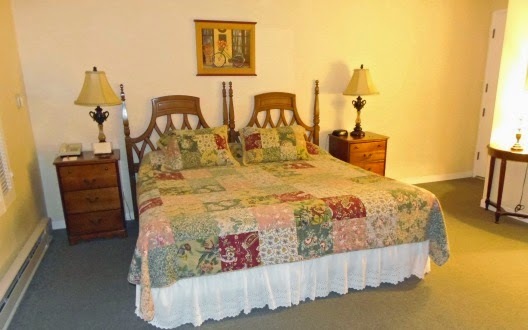 This lodging review was conducted on behalf of the Pennsylvania and Beyond Travel Blog. Her thoughts and opinions are 100% her own. To learn more about Hofsas House please visit their web site, find them on Facebook and on Twitter.